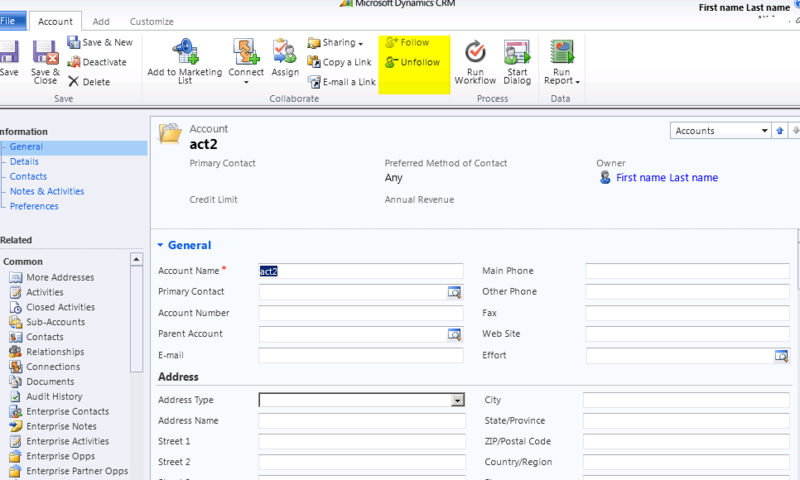 This post will focus on all the new enhancements to the Activity Feed feature in Microsoft Dynamics CRM 2011. The official build is not yet available, but the beta build was released May 10th. 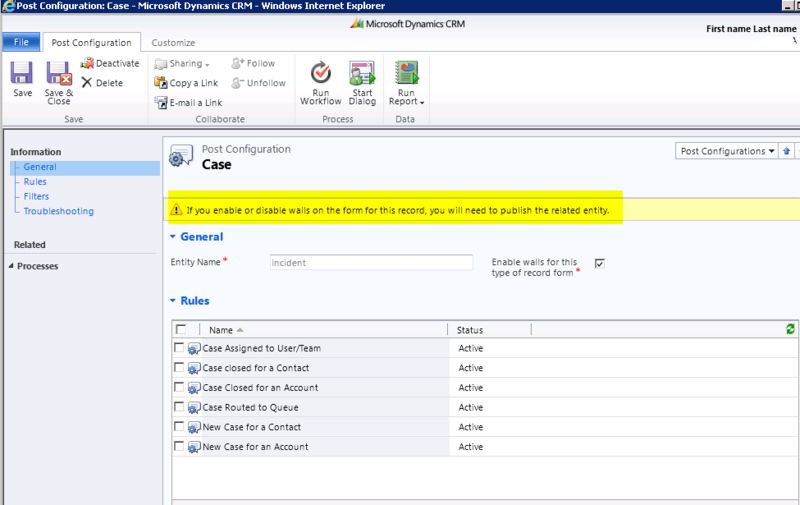 FYI – Here are details on how you can get the CRM 2011 UR9 beta build. The first change is in the Activity Feed Configuration list. You will now notice that all core entities that are supported for feed configuration, along with custom entities, are listed. Earlier we had to created a new Acivity Feed Configuration record for each entity. Now activate a rule either from the list or after opening an existing record. In this case, I’ve enabled the case entity for activity feeds. Notice the alert message to publish the entity. The older version also had this requirement, but there was no clear notification available. This is much better! Sticking with the case example, in the Post Configuration form, notice a new section called “Filters” with a subgrid containing the Public Views for the case entity. Selecting an item in the section will enable the Show or Hide option in the ribbon. In this case, I’ve set 3 views in Shown Status – the “My Active Cases” view, “All Cases” view and “My Resolved Cases” view. These 3 are used in the wall to filter the messages, which I will get to momentarily. Another new UR9 feature is the ability to follow or unfollow a record from the record ribbon and record wall. Tip: The follow/unfollow button works only if the entity has been enabled for activity feeds. It shows up by default for all entities with the Unfollow enabled, but clicking it will not do anything. 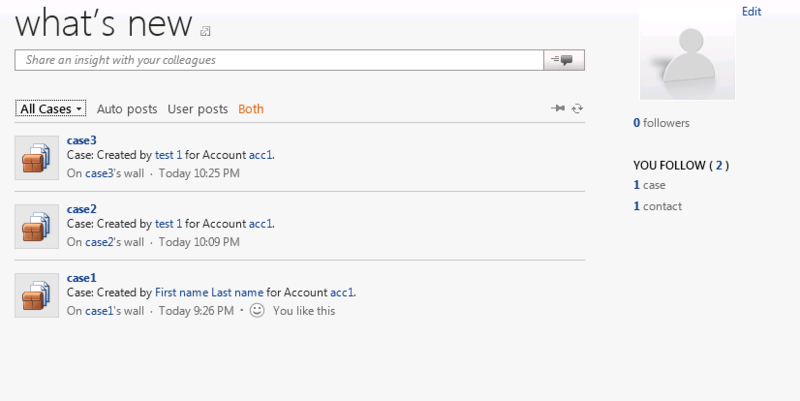 For example, I do not have accounts enabled for Activity Posts, and so you do not see the Record wall on the left navigation. The Unfollow button is enabled, but does not do anything. We have a default Activity Feed rule for Case that creates a feed on creation of a case. Once we have a couple of feeds, it is time to check out the revamped User Wall! The ability to “Like” and “Unlike” posts. The @me filter, which lets the user view all posts that mention them. 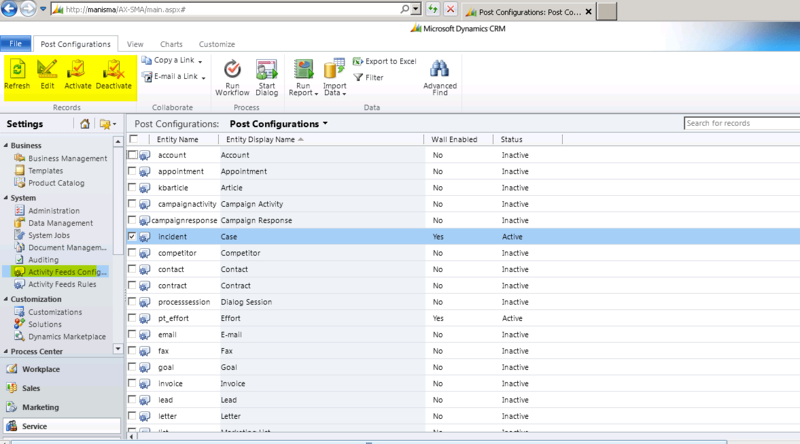 Filtering posts based on types of records they follow or based on data views configured within Microsoft Dynamics CRM. Lets take a look at each of them in action. The Like button next to the post puts a simley face and “You like this” text next to it. There is also a push pin icon right next to the refresh icon which lets you set the default view of the wall. The following figure gives the list of options to filter the posts by: either using the @me filter, or the records that I follow, or the views that we set to Show in the Post Configuration form/ Filter section. Filters can be based on types of records users follow. An example would be the Cases link under the “You follow” section, which gives me the posts for the cases that I follow. *Notice that I have only one case that I follow. 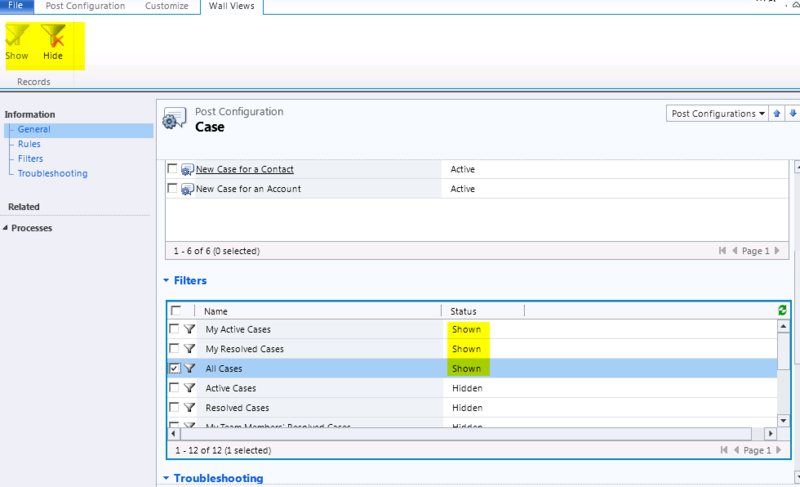 Filters can also be based on data views configured within Microsoft Dynamics CRM. In this case, under the “Posts About” section, the “All Cases” view will show all posts related to any case regardless of whether I follow those cases or not. Notice (below) that case2 and case3 were created by user test1, and are not followed by me directly. But I still can see if in my wall, with the option to make it the default view. Ability to set up team security. For example, the sales team might want their communication seperate (and hidden). Enable creation of new Activity Feed Rules for existing core and custom entites, rather than create a workflow process for custom posts. The release preview guide (pdf) has more details of the key new capabilities of the UR9 release with a summary of each.